What is the most important information I should know about neomycin, polymyxin B and hydrocortisone ophthalmic? What is neomycin, polymyxin B and hydrocortisone ophthalmic? Hydrocortisone is a steroid. It is used to treat the swelling associated with bacterial infections of the eye. Neomycin, polymyxin B and hydrocortisone ophthalmic is used to treat bacterial infections of the eyes. Neomycin, polymyxin B and hydrocortisone ophthalmic may also be used for purposes other than those listed in this medication guide. Who should not use neomycin, polymyxin B and hydrocortisone ophthalmic? Do not use neomycin, polymyxin B and hydrocortisone ophthalmic if you have a viral or fungal infection in your eye. It is used to treat infections caused by bacteria only. It is not known whether neomycin, polymyxin B and hydrocortisone ophthalmic will harm an unborn baby. Do not use this medication without first talking to your doctor if you are pregnant. It is not known whether neomycin, polymyxin B and hydrocortisone ophthalmic passes into breast milk. Do not use this medication without first talking to your doctor if you are breast-feeding a baby. How should I use neomycin, polymyxin B and hydrocortisone ophthalmic? Use neomycin, polymyxin B and hydrocortisone eyedrops exactly as directed by your doctor. If you do not understand these directions, ask your pharmacist, nurse, or doctor to explain them to you. Store neomycin, polymyxin B and hydrocortisone ophthalmic at room temperature away from moisture and heat. Keep the bottle properly capped. What should I avoid while using neomycin, polymyxin B and hydrocortisone ophthalmic? Use caution when driving, operating machinery, or performing other hazardous activities. 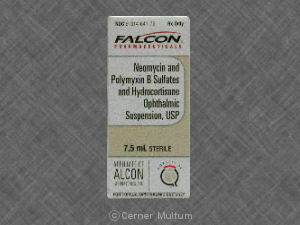 Neomycin, polymyxin B and hydrocortisone ophthalmic may cause blurred vision. If you experience blurred vision, avoid these activities. What are the possible side effects of neomycin, polymyxin B and hydrocortisone ophthalmic? What other drugs will affect neomycin, polymyxin B and hydrocortisone ophthalmic? Drugs other than those listed here may also interact with neomycin, polymyxin B and hydrocortisone ophthalmic. Talk to your doctor and pharmacist before taking any prescription or over-the-counter medicines. Your pharmacist has additional information about neomycin, polymyxin B and hydrocortisone written for health professionals that you may read.